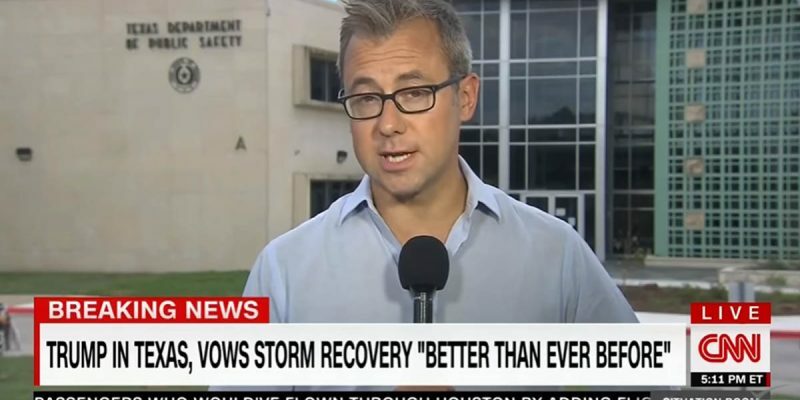 CNN’s all-hands-on-deck, credibility-sacrificing, relentless crusade to bring down Donald J. Trump is coming back to haunt the network as it covers former hurricane Harvey in Red State Texas. On Wednesday several Trump supporters yelled “CNN is fake news!” during one of the networks on location live broadcasts. CNN’s Jeff Zeleny was bombarded by Trump supporters during a live spot from Austin, TX on Tuesday. “What about Antifa?” asked another person unseen by CNN’s camera. “CNN is ISIS,” is also heard by an off-camera heckler. I used to watch CNN quite a bit before Trump was elected but the network is now so committed to bringing down the president, for any and all reasons, it has gotten to the point where it is not watchable. CNN reminds me of someone who is so obsessed with their ex and hates them so much that all they do is talk about them in a negative light. You’ve seen these people. It’s all they talk about. It’s really quite sad. Keep in mind there was a time before Trump ran for president that he was a media darling. Wednesday’s incident of Texans trolling a CNN reporter was not the only time where Texans embarrassed the network during one of its live shots. A woman lashes ou​t at in a profanity laced tirade at a CNN reporter for sticking a camera in front of her face while she and her child are cold and wet during a difficult time for them. As you can see by the video below, CNN didn’t handle the situation very well. Anchor and Trump agitator Jim Acosta tried to rush to a break in hopes to downplay what just happened on their air but it was too late.